Panchajanya is the divine conch or Shankh that emerged from the ocean of milk during the Samudra Manthan (the churning of ocean) by the gods and demons for Amrut (Ambrosia). 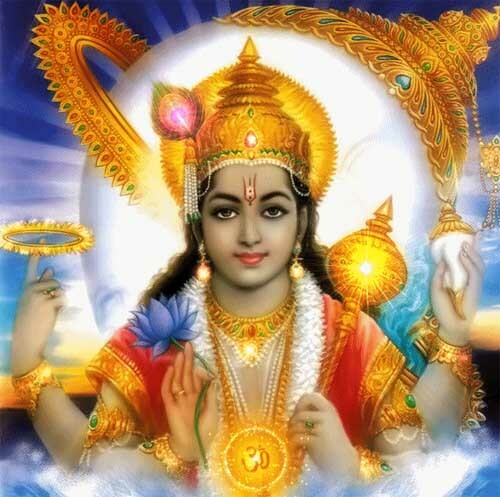 Lord Vishnu received the Panchajanya, which is considered to be a divinity in its own right. It is held in the upper left hand of Lord Vishnu and paired with the wheel or Sudarshana Chakra in his upper right hand. These two attributes are commonly held by the first five of Vishnu’s ten incarnations – Matsya, Kurma, Varaha, Narasimha and Vamana. Panchajanya is also widely associated with Sri Krishna. He blew it in the great Kurukshetra battle. There is lot of symbolism attributed to Panchajanya. Lord Vishnu himself is said to be represented in the Shamkha (Conch). Sun and Moon are said to reside in it, Varuna, the god of waters is said to rest in the middle portion; Prajapati, the first born and the progenitor of all beings in its tail portion; and River Goddess Ganga and Saraswathi in its front portion. There are numerous stories as to how Krishna came to own the Panchajanya. A story in the Mahabharata says that Krishna go the conch after killing demon Panchajana who live in the Patala or netherworld. Vishnu Purana and Harivamsa have different versions of Panchajana. As per one version, the demon used to live in the conch and Sri Krishna got the conch after killing the demon.